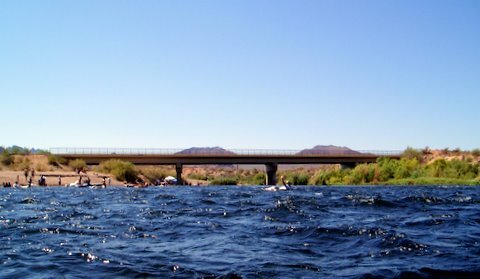 What’s this Salt River tubing Arizona thing? After you pick up your tubes, a bus will whisk you to a drop off point right next to the river. Then you hoof it down to the Salt River. It’s an easy fast hot walk through the desert. Walk fast from the road --it's hot! Wave good-bye to civilization as you wade into the cool water. The bridge will be the last man-made thing you will see for a while. Here’s a look at some of the experiences and sights that you might see on a typical trip. This trip is from the Blue Point Bridge to the Goldfield Exit 4. Oh, did I mention the water feels great when it’s a hot summer day! You will get the hang of tubing real fast because it's sooo easy. Just let the force of the river pull you downstream. And relaxxxx. Here’s the first video right after the bridge with the sounds of some giddy people excited by the start of the fun in the rapids. Not everyone uses a tube, there are some alternate modes of fun like kayaks. Here’s a video of some kayakers paddling by. There are some hills that seem to be cut in half by the action of the water. Here’s a look. If you notice, there is a small cave where you might see some people jumping off into the water. It looks crazy because the hill doesn’t seem very solid. I'd recommend you stay clear. I asked a friend that used to patrol this area with the Sheriff's office about water safety on the river. He said it was very dangerous to dive off this ledge because of hidden rocks in the murky water. Some call this "drinking and diving." Also, if you can't swim don't even think of going down the river. Why? Because you can fall off the tube. Be safe and you will have a great time. You will see beautiful areas with reeds next to the water's edge. Here’s a video. Note the mountains in the background. They are covered with tall Saguaro cacti. The Salt River Arizona water can be almost crystal clear. Just depends on the luck of the day. This video shows how transparent the water was. See if you can make out the stream boulders and some green wavy weeds zooming by underneath the surface. Ahh, the good life! What a great way to spend quality time with friends, family and larger kids. 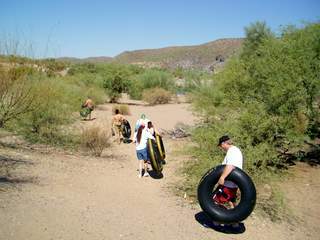 Salt River Tubing Arizona = FUN! The last smooth water before exit 4 has a nice view of Red Mountain. Officially this is called Mount McDowell. 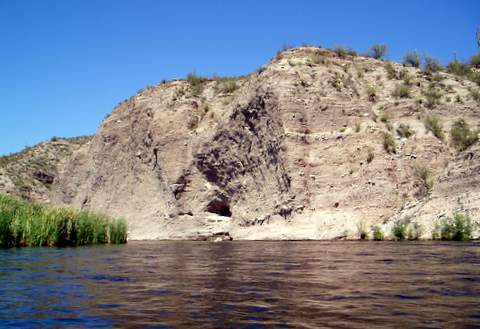 Red Mountain is visible in north Mesa and is a landmark. You can drive by Mount McDowell if you ever take a joyride on the Beeline Highway or the Bush Highway just north of Mesa.